If the term wealthy enclave means anything, Atherton (per capita income about 20 times population) is it. The leafy town of Atherton abuts a mere 0.8 mile of the peninsula rail corridor, and yet may turn out to be the greatest friction point for HSR on the peninsula--and possibly anywhere in California. This is not because of technical difficulty, but rather because the town is more willing and able than most to employ legal means to get its wishes: as a first priority, a routing of HSR that is not through Atherton (namely, via the Altamont Pass), and as a last resort, the construction of a tunnel to put Caltrain and HSR completely out of sight. the remainder of the property may not be condemned unless it is actually needed for the project; condemnation to limit remainder damages is not sufficient to support the taking. In short, Atherton warned that running HSR through town would entangle the project in an expensive and drawn-out legal battle. That battle has already begun: Atherton was a co-plaintiff in a partially successful legal challenge brought by environmental and transit activists against the above-mentioned EIR, forcing it to be revised. Doubtless this is only the beginning. Despite the controversy around the issue of eminent domain, the Caltrain right of way (see maps for mileposts 27 and 28) is 80 - 85 feet wide and straight as a ruler everywhere along the 0.8 mile section that falls within Atherton town limits. In principle, this is sufficient space to accommodate four tracks, although temporary construction easements may still be required to build the grade separation structures at Atherton's two grade crossings, Fair Oaks Lane and Watkins Avenue. 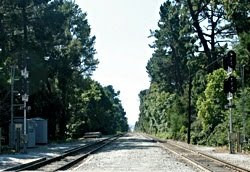 Trees are highly prized in Atherton, and many large volunteer trees growing on the railroad right of way would have to be removed. Caltrain's electrification EIR identified 80 trees that would need to be removed for a two-track at-grade electrified configuration; a wider four-track arrangement would likely result in even more tree removals. The existing tracks slope down at a gentle (less than 0.5%) grade to the north, and cross a drainage ditch known as the Atherton Channel at Watkins Ave. The vertical alignment of the tracks through Atherton is intimately linked to the choices made in neighboring Menlo Park, which has several closely-spaced crossings that would require a consistent vertical alignment to be used through both cities. The existing alignment is shown in the figure below, created from Caltrain track survey data. Even with the program EIR in legal trouble, project-level environmental work is continuing, with the CHSRA's preliminary design alternatives including elevated, at-grade and below-grade variations of the vertical alignment through Atherton. An elevated alignment, as originally suggested in the program EIR/EIS and as previously studied in neighboring Menlo Park, would raise the tracks about 15 feet and lower the roads by about 5 feet. Pedestrian sidewalks would stay at grade. The tracks would have to be elevated over all six crossings in Menlo / Atherton, as shown in the figure below. Note, the 1% grade specified for freight trains considerably lengthens the northern approach to such an elevated structure. Putting the tracks in a trench would require lowering the rails by 30 feet, to accommodate tall freight cars under overhead electrification. The solid red line in the figure below shows a trench alignment. The tracks must rise back to grade at the existing Fifth Avenue grade separation to the north, so trains, tracks, poles and overhead wires would be out of sight for only a portion of Atherton. Again, freight-friendly 1% grades are shown. A letter from Atherton (see p. 5) states a preference for an unusual two-level stacked tunnel arrangement, with two HSR tracks in a tunnel on the lower level and two Caltrain / UPRR tracks in a trench on the upper level, as diagrammed in the notional cross-section at right. All roads would remain at grade, and the horizontal clearances would "fit well within" the 80 - 85 foot right of way, purportedly allowing trees to be preserved. The vertical alignment for such a tunnel is shown in the vertical profile (above) as a dotted red line. Accounting for the minimum vertical clearances, the HSR tunnel would bottom out about 75 feet below grade, well below sea level. The extensive ventilation head houses, emergency evacuation stairwells and pump houses required to operate such a tunnel are not shown in the diagram. The concept was originally proposed by Redwood City resident James Jonas, who calls it the Hat Trench. Jonas was invited to present the concept to Atherton's rail committee in summer 2009. It remains unclear who would pay for such a pharaonic tunnel structure. While the price of property in Atherton is high, it remains small in comparison to a tunnel. Less easy to quantify is the price of a view and the price of peace and quiet. Are those truly worth $10,000 per linear inch? Atherton should have plenty of MBA's to figure it out. NOTE: This post will be updated continuously, as warranted by additional information or new events relating to Atherton. LOL - how absurd. This claim implies that, post-HSR, Atherton will be so undesirable that people would not even live there for free - you would have to give them a free house AND pay them just to get them to live there. If they really believe that nonsense, then I've got a great offer for the City of Atherton - I'll live there post-HSR if they just give me a free house. No need to even pay me! I'm that generous. P.S. 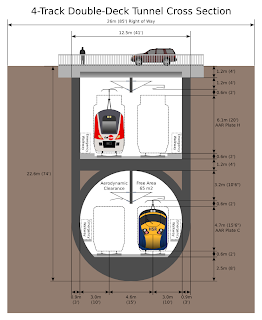 : If Atherton pays 100% of the difference between elevated and the tunnel, including maintenance costs - I'm all for it! Especially if anyone who was born or has lived in Atherton in the last 20 years is prohibited from taking the CalTrain or high speed train. This whole double-stacked thing seems quite over-engineered to me. While it may not be as expensive as a four-track tunnel, I can't imagine that it's cheap. My guess is that the tunnel is bored, then used for trains as the trench is excavated. Quite a complex operation just to save a few trees (not that I have anything against trees...). Plus, is four tracks on a low areal really that big of a deal? The trees belong to Caltrain. They can cut them down. Atherton can huff and puff or hold it's breath until it's blue. They are Caltrain's trees. Who's to say that the trees wouldn't need to be cut down to make room for construction anyway? thank you for this post. Once again, your graphics in particular will be very valuable in furthering the discussion. 1) if an elevated structure were built in Atherton and Menlo Park, why descend from it at 1% south of Ravenswood Ave just to climb back up toward the border with Palo Alto? Wouldn't planners seek to minimize elevation changes via a much gentler ramp through the Burgess Park area? 2) if a trench were chosen, wouldn't the alignment rise back up south of Oak Grove Ave to reach grade level north of the bridge across the San Francisquito bridge and the environmentally sensitive El Palo Alto tree? I realize that might mean a shallow overpass at Ravenswood Ave, but would that be the end of the world? 3) If a stacked tunnel were chosen, wouldn't both levels be excavated using cut-and-cover? More fundamentally, what would happen to gravity-drained conduits that cross the ROW, e.g. the Atherton Channel? Your diagram shows just 17 feet of clearance above the top of rail in the trench level. Wouldn't an underground solution of any kind and especially, a stacked tunnel, massively increase the risk of local flooding after a heavy downpour? "a routing of HSR that is not through Atherton (namely, via the Altamont Pass)"
This is a persistent misconception. Altamont-via-Dumbarton would indeed allow HSR trains to run from SF to LA without any tracks through Silicon Valley. However, the political reality is that HSR must also serve San Jose. That city will no more accept being cut out of phase I of the network than San Francisco would. With BART now definitely being extended south to Santa Clara via the WPML, the only remaining right of way for an HSR spur in the East Bay would be via the I-680 and I-280 medians. Connecting to those would require a five-mile tunnel between Fremont Irvington and Sunol plus a shorter one just south of Diridon station in San Jose. In other words, a spur down to San Jose in the East Bay would cost massively more and deliver massively less transportation value than forking the line in Redwood City and running HSR tracks through Silicon Valley, electrifying and fully grade separating Caltrain in the process. Why on earth would PCJPB be interested in sharing any of its ROW with HSR unless it can do so for the entire distance between SF and SJ? So, if you're going to have to run HSR tracks through Silicon Valley in any event in order to serve San Jose, it makes sense to avoid a fork and run tracks through Pacheco Pass. So basically, this fight boils down to Atherton/Menlo Park/Palo Alto/Central Valley vs. San Francisco/San Jose. Three guesses who will come out on top. Note that folks in SoCal won't be prepared to spend additional billions to preserve a small number of trees in the SF peninsula when that money could arguably be spent more productively on the LA-Ontario-San Diego spur. "However, the political reality is that HSR must also serve San Jose." Please stop deliberately, systematically, unethically and laughably mis-representing reality. We have enough full-time sleazebags on the SVLG, PBQD and CHSRA payrolls to do this without your Very Special Contributions. Everybody in the world other than you is aware of how Altamont would have worked. Rafael Alternate Reality is simply of no interest. Nobody has ever suggested HSR not serve the mighty City of San José, Capital of Silicon Valley. So at least stop outright lying about that one issue at the very least, OK? Small note: the Fifth Avenue road undercrossing needn't be any sort of impediment to the pharaonic tunnel structure. Put the road back up at grade (where it belongs, and ought to be restored anyway if the track design is done correctly, ie 10-15' above existing grade) and continue to trench and tunnel all the way to San Francsico, San Rafael, Eureka and Vancouver. AB3034 defines the starter line as "San Francisco Transbay Terminal to Los Angeles to Anaheim". Note how San Jose is in fact not on that list. CHSRA did study not one but two Altamont variations that included HSR tracks through Atherton etc. It rejected both, as it did all of the Altamont alternatives that avoided Silicon Valley. The one that shows HSR trains running along the UPRR-owned Milpitas line blithely ignores how narrow that right of way is between 101 and 87 and that UPRR anyhow has zero interest in selling it. Blithely asserting that "everybody in the world other than you is aware of how Altamont would have worked" isn't going to cut it. Show us how Altamont-via-Dumbarton would serve San Jose while bypassing Atherton! Where would you, oh great sage, put the damn tracks between Fremont and San Jose Diridon? back to Atherton: is there any affordable middle ground, e.g. a four-track shallow trench (top of rails 15' below grade) with regular overpasses (road surface 15' above grade at the crest)? With an FSSF track order, the trench could - with a contribution from the city - be covered with an arched lid covered by vegetation, possibly a bike/ped path along the crest. It would no longer be possible to see across the right of way, but thanks to the curvature and hidden catenary wires, the visual impact would be far more benign than the vertical walls of a retained fill embankment (even if partially obscured by climbing plants). Noise would also be contained, without the high cost of a full trench or bored tunnels. The excavated spoil could be used for raised embankments elsewhere in the corridor. Are there other viable alternatives to fully elevated and fully buried tracks? @Rafael: That sounds like an excellent compromise. Maybe someone with artistic abilities could illustrate it, for discussion purposes? While cars can handle a much steeper grade than trains, putting the tracks lower means you have to have deeper undercrossings, which means you need to close more driveways and pour more concrete perpendicular to the tracks. It seems like the -5/+15 car/tracks proposal is already a compromise. Maybe there's a -10/+10 option that would work. I'm not familiar with those streets enough but looking on google maps there appear to be many driveways on the cross streets. Sinking the roads more than a couple feet might mean getting rid of those driveways, which effectively means taking that property. I was talking about sinking the rails by 15 feet and constructing road overpasses. But your point is well taken, changing the road elevation does have impacts on existing intersections with frontage roads (if any) and access to existing properties. Split grade separations do involve substantial roadworks. Would the "HAT Trench" allow the current freight trains to use the tracks? Don't they need thirty feet between top of rail and the OCS? no, the loading gauges for various types of rail vehicles are documented here. Plate H cars are only 20'2" high, the additional distance serves to prevent electrical arcing (i.e. a short circuit) between the overhead catenary and the freight car. Note that freight in the peninsula is currently limited to plate F cars. The whole plate H business is being treated as a hard requirement, but it's really just a request by the Port of San Francisco which wants to get into the business of importing cars and shipping them in bi-level autoracks to increase its annual revenue by $2.5 million. Is that worth excavating an additional 3 feet of tunnel depth? Also consider that diesel locomotives need a lot of forced ventilation in any kind of tunnel, both to supply fresh air and to clear the exhaust gases. High capacity fans are needed to clear smoke in the event of a tunnel fire, even if all trains are electric. Bottom line: don't bend over backwards to accommodate heavy freight rail in the SF peninsula, especially if you're considering constructing new tunnels. The cost-benefit ratio to the general public of kowtowing to UPRR and its customers is out of whack. @Adirondacker: you are correct that all trees on the ROW belong to Caltrain and are not subject to city tree ordinances. In practice, they still have to consult with the communities (see for instance the recent horn fiasco). @Reality Check, I have no idea what the ongoing maintenance costs of a tunnel might be--except that they are not zero. @Rafael, the channel would pass under the trench / tunnel using a pumped siphon. Not trivial. As for the Altamont discussion, I am reporting Atherton's views, period. Your idea of an FSSF shallow trench is interesting, I'll have to think about that. @AndyDuncan, the +15/-5 split grade sep has the advantage that sidewalks remain at grade with no slopes, ramps, stairs, or ADA nonsense. That makes for a more walkable, accessible environment to get across the tracks. Also, a general comment: all tunnels require extensive forced ventilation infrastructure for reasons of climate control and especially fire safety. When there's a fire you want to control where the smoke goes. From everything I know about 25kV electrification, you need at least one foot of clearance from the top of the car to the wire, and another foot from the wire to any structures (but that might be reduced to 10 inches). With rigid overhead, you'd probably need a total clearance of 22'6" from top of rail to tunnel ceiling. Atherton is perhaps the third richest community in California (after Belvedere and Rancho Santa Fe. That doesn't, or at least shouldn't, grant them any advantages when it comes to HSR compared to other communities. Low-income communities deserve mitigation as much as their expensive counterparts (if anything, more so). Additional operating / maintenance costs for tunnels as compared to at-grade and aerial options due to ventilation, lighting, emergency access / egress, monitoring of operations, and other operating activities. Slightly higher operating costs expected compared to at- grade option due to maintenance obligations for aerial structure. With BART now definitely being extended south to Santa Clara via the WPML, the only remaining right of way for an HSR spur in the East Bay would be via the I-680 and I-280 medians. I've pointed out elsewhere there is another way, and if I recall correctly you've stated a solution similar. The Western Pacific Milpitas Line (WPML) is now owned by the VTA (Santa Clara County) and will be used for BART to SJ. A standard gauge track will remain, and UP will retain trackage rights. WPML is essentially a short, probably lightly-used, branch line serving a small number of industrial customers. After Western Pacific (WP) went bust/bought by UP, it sold or abandoned the William Street Rail Yard in San Jose. This severed the link to the SP/UP main line just to the south. The property is currently occupied by low density housing. It even still kind of resembles a rail yard from aerial view. It doesn't have to be like this though. If this gap, less than 1 mile in length, is restored by the VTA or CHSRA, either through condemnation or (more likely) expensive tunneling under those houses, UP can run freight around downtown SJ. Which helps passenger rail in and of itself in Santa Clara to SJ segment, but also frees up UP's Alviso line, and particularly, UP's lightly used Southern Pacific Milpitas Line (SPML), just west of WMPL, into downtown SJ. A deal with UP, where we restore the WPML in exchange for the lightly-used (and redundant under this plan) SPML to use for exclusive passenger use in and out of SJ Diridon, is a reasonable possibility if the VTA or CHSRA would pursue it. Of course the VTA wouldn't pursue it, because they can't see anything beyond their ridiculous $8 billion BART toy. It remains to be seen if CHSRA will pursue it for the Altamont Corridor project. But given that the remaining options for Fremont-SJ are bad (i.e. aerials in freeway medians) to worse (i.e. impossible amounts of tunneling), this seems like the only way for that project to succeed. Even if CalTrain only got billions in free upgrades for SF-RC, that'd still be a Good Thing for CalTrain. The 3 Peninsula Counties could have agreed to split the cost of upgrading the remaining RC-SJ segment, which might only be $1-2 billion in total. Certainly doable for them, but that assumes Santa Clara County actually gives a damn about CalTrain or real passenger rail services in general. CHSRA job, first and foremost, is to select and implement an HSR alignment that best serves those needs. Accommodating freight and commuter rail in the process is great, and the right thing to do wherever possible, but it's just whipped cream on top as far as HSR goes. Going out of its way (i.e. selecting a different alignment) to accommodate (i.e. give away billions in free upgrades) other rail operators isn't CHSRA's prerogative. In any case, it's a moot point. The entire Peninsula line will be upgraded anyway, and it's a worthwhile endeavor regardless of what some silly wealthy NIMBYs think. Do we know what the marginal cost for boring a AAR Plate H tunnel is over AAR Plate F tunnel? It seems like it shouldn't be that big. Obviously cost explodes once you decide to go below grade. But that's because of the costs of specialized labor, moving out all that earth, and all the other things that go into boring a hole. The cost of a larger TBM isn't much more than a smaller one, nor is the cost of operating it. The cost is all in the decision to go underground, and all of the things needed to make that happen. Basically what I'm asking is, if we have to dig in some areas, shouldn't the hole be as big as practical? This is why the Paris RER can run bilevel EMUs and BART can't. If that's the case, we could take it to another level. This might sound a bit crazy, but since the HSR project is going to bore some serious tunnels anyway (i.e. Pacheco and Tehachapi), if we used large TBMs to do it, could we reasonably accommodate heavy freight as well? I'm assuming that each direction requires its own bore because of air compression or some other technical reasons. If both directions can be in one bore, it definitely doesn't make sense to do this. But if 2 bores are needed anyway, using larger TBMs for 2 tracks in each tube, 1 for HSR and 1 for freight might be possible. This would be particularly invaluable at Tehachapi, which is a single track, UP line (BNSF has trackage rights) and heavy congested. Probably the most congested rail segment in the state, and big roadblock to mode shifting freight onto rails. An offer like this would be a strong inducement for UP cooperation statewide. Granted heavy freight rail needs less steep grades, which might also make it impractical. Do we know what the expected gradient is for the Tehachapi segment? Is there any issue with pantographs with regard to different catenary heights? Are there standards for this? Supporting AAR Plate H with OCS seems like a very unique situation. Now that I think about it, I don't think any rail operator in the world does it. I remember hearing China Railways or a Chinese port doing something like that, but it didn't support 2 full-sized containers stacked on each other, only 1 big container and 1 smaller one could fit under the OCS. I know some pantographs are pretty large, like on single-level light rail and streetcar vehicles which have to reach up to OCS with enough clearance for large trucks. Reaching up to 21'-23' or so should be doable for a bilevel EMU set, if awkward, but a single-level EMU reaching up that high does seem ridiculous and impractical. "Supporting AAR Plate H with OCS seems like a very unique situation." Not sure, but I'm guessing 20-ft-2-inch stacks run under ex-RDG 11-kV catenary in the Philadelphia area. "Reaching up to 21'-23' or so should be doable for a bilevel EMU set, if awkward, but a single-level EMU reaching up that high does seem ridiculous and impractical." I bet 21-ft catenary height is common on PRR and RDG lines that host MU trains. Dunno about 23 ft. I wasn't talking about routing freight through East San Jose, nor was I looking to re-open the debate on the merits of the BART extension. My point was simply that there isn't a viable right of way for HSR tracks between Fremont and SJ Diridon. The Southern Milipitas line is extremely narrow and adjacent to multi-story residential buildings, e.g. in the Ryland Park area. The water table there is high, so stacking single tracks while still fully separating them from cross roads would be extremely difficult(tunnel + aerial). VTA light rail would need to be brought up to grade at 1St Street. Unfortunately, even that is moot as long as UPRR wants to hang on to its Fremont yard, with primary access from the Niles end. The whole basis of this thread seems to be that Atherton, the wealthy city, is the only source of funds that might possibly be able to defend itself in court cases. Clem is ignorant of the facts, since he implies that funding for the lawsuits have been mainly from Atherton. It is really none of his damn business as to where funding comes from, but rest assured, Atherton was not the major source of funds to date. Prop 1A was passed using fraudulent means. The public didn't know what they were getting, and that is not only true in Bay Area, but all along the route. As more information has finally become available, it is now obvious the opposition all along the route has increased greatly. Why do they now need to hire a PR firm to put down opposition and try to keep up the notion that this project is a god send. The project id going down in flames, but that conclusion is still a bit off; only after spending a few billions enriching PB, HNTB etc. will it be stopped. How much longer are the voters going to fund this beast, when we can't afford our school system, provide adequate social services and build much more needed infrastructure, like water delivery. NO, the lies that have pushed this project thus far are now being exposed and it will not be too far along this time lime before it will be stopped. 100,000,000 passengers per year === lunacy. "It is really none of his damn business as to where funding comes from, but rest assured, Atherton was not the major source of funds to date." Actually. it is his business. Along with all the rest of the people who voted yes on Prop 1A. He is a taxpayer who may or may not have voted for Prop 1A last year, but the lawsuits are costing him money to defend the case, as being a California taxpayer, which could be better spent elsewhere. Instead of fighting frivolous lawsuits. I was at the Altamont Corridor Rail Project scoping meeting in Stockton last week and there is a way to San Jose. The Authority and ACE are planning how to get From Stockton to San Jose right now. In fact the Authority and ACE are looking at two routes from Diridon Station to the 237 interchange and two routes from Pleasanton to Fremont. The 237 interchange and Fremont NIMBYs seem to be the biggest two obstacles. The run from 237 north along 880 to Fremont will be easy. If you want I can forward you more info. Not sure I get how the tunnel in your diagram works - why would there be a round, evidently bored, tunnel directly under a trench? If you click the Hat Trench link, the actual proposal is hilariously stupid - it's a round tunnel, apparently bored, yet it's open at the top. And apparently the train cars are about the size of London Underground deep level stock. WRT Brian Stanke's comments - interesting. So the next time they bring the Bay Area program EIR back, it seems like they'll be comparing Pacheco to a new and improved feasible altamont alternative. (Because the Program EIR has been orderd decertified by the judge, so all the newly available information will be brought in to the next incarnation of Program EIR submitted for public review and ultimatey upon whch the CHSRA will be basing their next 'preferred route' determination.. so sounds like they'll have a whole bunch of new info to bring to that program EIR regarding Altamont. It could be bored or cut & cover. Boring it would avoid the need for a shoofly track (and temporary property takes and tree removals) during construction, which is why I drew it that way. Either way it would be about the same dimensions. You would bore the tunnel, put Caltrain in it (after electrification), and then remove the old tracks and excavate the upper level. The 41-foot bore diameter shown in the diagram is nearly as big as TBM's can get, the same diameter as the 2-track 125 mph tunnels built in Switzerland over the last decade. (here's a picture of a 45-footer, the world's biggest TBM.) Either way this is very very expensive stuff, and very very unlikely to ever happen on the peninsula just to save a few trees and a few views. My read of the tea leaves is that Atherton will end up with an elevated, or, at the very best, a four-track trench. Or no HSR at all--tunnel or nothing, if that is indeed the proposition, will result in nothing. "It could be bored or cut & cover." Good luck boring through barely cohering holocene sediments below the water table and then excavating out the fill cover that's all that's keeping the (low-density, air-filled) tunnel from popping right out. that's keeping the (low-density, air-filled) tunnel from popping right out. Right you are. I forgot to add the keel. Just one of many reasons not to build tunnels. so they intend to run an aerial in the I-880 median all the way past 87? That should be a piece of cake to construct. Right next to the end of the SJC runway, too. Considering ACE currently gets 3000-3500 riders on a weekday, this plan makes eminent financial sense! The tracks will probably curve off of 880 at 87 toward the CalTrain CEMOF, though probably still on an areal. Alternately, all of the roads in that area could be lowered, allowing the tracks to run at grade. This would also allow them to pass under 87, rather than over on a high areal. There is a route which does bypass Atherton, Menlo Park, and the lower peninsula, and which, when all the dust settles, might be less expensive and technically much simpler than the other routes being proposed. This route proceeds from Santa Clara northward to Alviso along the UPRR ROW, then across the mudflats to the western end of the Dumbarton rail bridge, and then into Redwood City along the JPB-owned Dumbarton main ROW. The ROWs are wide, with few grade crossings, and pass through mostly light industrial areas. Sure, there are problems with the route, one of them being avoiding the Don Edwards NWR; this can be done since the NWR is not continuous across the south end of the bay. The mudflat section would be built on a causeway supported by pilings, so as to not inhibit wildlife crossings. Yes. the airport will be a headache, 880 is in a trench in that area for a reason. That is why they prefer the Trimble cut across. If you are so interested in the engineering details I suggest going to a scoping meeting or calling them. It can really help with these sorts of questions. As to your "3000-3500 riders on a weekday" comment. remind me how many take the train SF to LA per day now? Sac to LA? Including the San Joaquin bus-bridge? Yeah faulty premise to apply to SF-LA or Sac/Stcktn/Merced - SJ. ACE is a one-way commute-only ride with infrequent, slow, and unreliable service. Don't tell me you look at 580, 680, 237, 84 and 92 and think today's ACE is as good as transit service can get. Or anywhere close to servicing the market that exists now, no less after TOD efforts over the next 20 years in all the station cities. Rafael, Altamont Commuter Express (ACE) only runs THREE trains each way. To move 3000-3500 daily riders with such limited service and rolling stock is quite impressive. Just imagine if the service is significantly improved! It's a much, much better investment than the BART-to-San Jose boondoggle, the preservation of which is what the Pacheco Pass red herring is all about. LAX-SFO has about 4500 daily passengers per day, so 3000-3500 daily passengers is very reasonable for a slow, relatively long commute with three trains each way! Long-distance traffic is always much less than local and regional traffic. That seems like more trouble than it's worth just to bypass a few NIMBYs. You're still impacting the wildlife refuge with construction anyway. We'll have to bring in the California High Speed Submarine Authority. I wonder what running a 25kV line that close to the airport and the radio navigation equipment would do to the ILS signal integrity for planes going into San Jose. There are two transmitters I'd be worried about: The glide slope transmitter for 30L and the localizer for 12R. Has anyone ever studied this stuff? But what about LAX-OAK, BUR-SFO, BUR-OAK, and all the other airport pairs? I don't know specifically, but both SNCF and DB run HSR lines to airports, and SNCF's line is electrified at 25 kV. In addition, JNR intended to run a 25 kV line to the airport in the 1970s, until the plans were scrapped due to community opposition. Yes, but I doubt those lines came that close to the end of the runway. I'll check how close the 880 median is to those transmitters on Google Earth when I get home from work. Caltrain First, can you provide a source for your numbers? I'm not saying that as a challenge, I'm interested in getting more information. For example, including San Jose and the other LA area airports. Yeah, I think that the OCS may indeed pose a problem at San Jose if it passes along the median of 880. Using some basic measurements based off of Google Earth, the localizer transmitter is a mere 300 feet from the median of 880. The glide slope transmitter, while being located 4000 feet from the median, could also be affected, as it sends out an electronic glideslope of 3 degrees. That places it over the median of 880 at 209 feet. That's a very bad number, as that would be right around the Decision Altitude for the ILS approach to 30L. So, essentially, an airplane making an approach to 200 foot ILS minimums could lose the glideslope at the worst possible moment. Not a good idea if you ask me. @Peter -- instead of multiple speculation-filled posts, why don't you take some time to figure out if there's an issue ... or just raise it and let the pros (whose job it is to figure such stuff out) figure it out? It would be surprising if there is no data/research/knowledge out there on what effects -- if any -- AC current electric lines have on avionics, ground-based transmitters, etc. Multiple utterly speculative postings are a waste of everyone's time, and can border on baseless fear-mongering. (OMG! -- HSR could make planes on ILS crash and burn!). the Trimble Road approach would be preferable ot I-880 as tracks could then run right past the SJC terminals. Ironically, that is what the Bay Rail Alliance has been advocating all along with its electric Caltrain Metro East proposal, but VTA poo-poohed it because it wasn't BART and it didn't run past City Hall. My assumption is still that the planning for the Altamont Corridor will be completed in the context of AB3034 but that its construction will have to be funded by some TBD mechanism other than prop 1A(2008), if only because of the limit of 24 stations on the HSR network. Partly because of this funding issue, I also suspect that the corridor may yet end up with FRA-compliant DMU rolling stock based on EPA Tier 4 engines and some grade crossings retained. Who knows, UPRR may even be willing to offer trackage rights on its Milpitas line as long as the equipment is compatible with its freight trains. I didn't mean to be alarmist or excessively speculative. I was just trying to see if it was in fact something to be concerned about. Since an aerial on the 880 median would place it right beneath Decision Altitude on the ILS, it is something that deserves to be studied. For people who are not pilots, I was simply trying to illustrate how critical that point in space really was. I looked at the causeway scenario some time ago, believing it might offer a way for HSR to Atherton et al. The Alviso ROW is owned by UPRR, which isn't co-operating with CHSRA. Part of it is narrow, with just a single track. It might be possible (but very expensive) to construct subway tunnels under traffic lanes on Lafayette Street, which runs roughly parallel to the Guadeloupe Creek. This is substantially different from e.g. the Atherton Channel, which would present a potential flooding hazard if the tracks ran in a trench. Threading the needle in-between parts of the DENWR should also be possible, but environmentalists will still bitterly oppose any alignment that runs above ground. In addition to construction impacts (e.g. stirring up methyl mercury in the bay mud), there's the permanent impact of noise and 25kV OCS wires that could easily force some birds to abandon nesting sites and fry others. However, the Big Kahuna in this context is the saltmarsh harvest mouse, an endangered species. Look up "Delta smelt" for details on how seriously federal judges take the ESA, regardless of massive economic and environmental impacts on human populations. In principle, the underground alignment could be continued well out into the Bay, emerging at an artificial island. The rest of the distance to Dumbarton could then be covered by a causeway. A precedent of sorts exists in the form of the Øresund fixed link between Sweden and Denmark. In that case, the tunnel was required because of an airport on the Danish side. Still, constructing an immersed tube through the South Bay salt marshes plus possibly an artificial island in earthquake country - ambitious, to say the least. Note that PCJPB might very well not be prepared to share its ROW with CHSRA unless it gets full grade separation plus electrification all the way to SJ Diridon. For sound reasons, Caltrain has decided against investing in dual-mode multiple unit rolling stock with both electric and diesel traction. the ILS/25kV OCS compatibility issue may also be relevant at Lindbergh Field if HSR tracks are elevated all the way to Santa Fe Depot there. The tracks will, in all probability, not be at the 880 median by the time they reach the south end of SJC. In order to reach Diridon station, they will need to curve south toward the CalTrain CEMOF at that point. Also note that they have to pass under or over SR87 right before the airport, which means that if they were elevated, they would have to be on a high areal (probably impossible considering its proximity to the airport). At grade or in a trench is much more likely. Of course that means very little for electrical interference, but I just wanted to clear up that technical point. How were they looking at transitioning past SJC on the east? They just built a new terminal and some MASSIVE parking structures. Then you have the creek, and then 87, and then, well, houses and other buildings. I'm having a hard time visualizing it. the Bay Rail Alliance plan is a few years old by now. I believe their idea was to run tracks on an aerial directly above the creek. The supports would have to be designed to survive a flash flood without causing the creek to overflow its banks in the process. I see building above the creek as being a non-starter. Hasn't San Jose spent a lot of money on rehabilitating the creek? 25kV OCS wires that could easily force some birds to abandon nesting sites and fry others. The birds would have to have extraordinary wingspans to get "fried" on the catenary. Birds aren't connected to the other part of the circuit and happily perch on high voltage lines. Just like some line workers do. For sound reasons, Caltrain has decided against investing in dual-mode multiple unit rolling stock with both electric and diesel traction. Why couldn't they run diesels into San Jose from the East Bay on the same tracks Capitol Corridor and ACE uses? No need for electric trains from the East Bay until someone decides to upgrade the East Bay. there are two line for FRA-compliant equipment between Niles and San Jose. The busier one runs through the salt marshes at Alviso. The other runs through Milpitas and the Ryland Park area of San Jose. Both are single track. The Alviso route can't be double-tracked because it was grandfathered in when the DENWR was created. The Milpitas ROW is very narrow and runs through residential neighborhoods. There is limited capacity on the Alviso line that is shared between UPRR, Amtrak Capitol Corridor and ACE. The Milpitas line is hardly used except for the section between Niles and the UPRR marshaling yard in Fremont Warm Springs. The Altamont Corridor project is supposed to identify a route for a pair of brand-new passenger-only tracks to massively increase capacity between the Central Valley and San Jose. Hence the bit about running in the I-880 median all the way top CA-87 or else on an elevated structure above Montague and Trimble Rd and past the SJC terminals. This idea was born out of the whole Altamont vs. Pacheco fight and I'm sure planners and the construction industry are quite chuffed at the prospect of building the BART extension plus HSR via Pacheco plus HSR via Altamont. What's less clear is who's supposed to be paying for HSR via Altamont on top of everything else. There's certainly a case to be made for a more modest approach based on beefing up the existing ACE service. Pressing the Milpitas line into service plus the one on the north slope of Niles Canyon plus the unused SP right of way through Altamont Pass would give passenger trains an essentially dedicated track where they need it most. The Niles Canyon and Altamont bits would be quite twisty, but over time a few short tunnels could be dug to rectify the alignment and permit higher speeds. This scenario would require co-operation from UPRR, but that should be possible for FRA-compliant equipment with top speeds of 79-90mph. The railroad may also want the right to run freight trains on any revived rights of way, at least in off-design conditions. As long as ACE is primarily a commuter service from bedroom communities in the Central and Amador Valleys to employers in the Amador and Silicon Valleys, respectively, there really isn't a pressing need for dual passenger-only tracks through Altamont. For bi-directional regional service between the Bay Area and Sacramento, upgrading Amtrak CC alongside ACE would IMHO yield more bang for buck than the Altamont Corridor as envisaged by CHSRA's world-class planners. Full-fat HSR through Altamont would only make sense if the preferred Pacheco Pass route proved impossible to construct for some reason. "As long as ACE is primarily a commuter service from bedroom communities in the Central and Amador Valleys to employers in the Amador and Silicon Valleys, respectively, there really isn't a pressing need for dual passenger-only tracks through Altamont." How much longer is the moderator going to permit these "Cliff Clavin" postings from Rafael? Anyone even remotely familiar with Bay Area geography knows that East Bay has bigger population than SF, and bigger than the SB. The Trivalley region has population as great as San Jose, and that the highways in and out of the region rank as top congested routes in the Nation. There is a 10x population differential between these two areas. You aren't making any sense whatsoever. Please go do your trolling elsewhere. Rafael: This idea was born out of the whole Altamont vs. Pacheco fight and I'm sure planners and the construction industry are quite chuffed at the prospect of building the BART extension plus HSR via Pacheco plus HSR via Altamont. How about just fast rail via Altamont??? Save $$$ and actually get something built! Altamont negates the need for BART-to-San Jose, which is the elephant in the room that Rafael misses. Pacheco Pass has never had a rail crossing and probably never will. "Cliff Clavin" is a spot-on description. 1. Altamont HSR makes Pacheco HSR and SJ BART redundant. 2. Pacheco HSR does not make Altamont HSR or SJ BART redundant. Also, Altamont HSR serves scads more cities and people in Phase I and substantially reduces HSR system route miles (=cost) and system net travel times when Sacramento is included. This must be why it was the obvious and clear, hands-down-preferred alternative for so long before SVLG and San Jose interests ("Diridonistas") managed to get Altamont magically dumped. I would also note that key environmental and transit advocacy groups were unanimous in backing Altamont HSR and denouncing Pacheco. Even the seminally-important DENWR-focused group Citizens Committee to Complete the Refuge backed Altamont knowing full-well that this entailed HSR in the Dumbarton Rail Bridge corridor through DENWR. No. Altamont with a split makes SJ BART somewhat unnecessary. Anything that conflicts with BART to SJ is good, but excessive line splitting reduces frequency to each destination, which makes ridership lower, not higher. Alon: but excessive line splitting reduces frequency to each destination, which makes ridership lower, not higher. "Line splitting"... or creating a network on which you can provide a full variety of services as demand evolves. OMG, look at all the "line splitting" in Europe! Must... have... more... redundant one-seat rides and duplicative service. SJ BART and high-speed ACE will offer different levels of service. Those people in a hurry and willing to spend a little bit extra will take ACE. Those that don't have to go that far or can't afford the higher cost of ACE will take BART. Europe has both route splitting and route duplication with different levels of service. Neither of which is inherently bad. It becomes inherently bad when the state can't afford it. Why not offer two different services on the same pair of San Jose-Fremont-Stockton tracks with strategic passing? This would be similar to the Caltrain/HSR proposal, and it doesn't require four-tracking all the way. Two tracks provide plenty of capacity. This simple proposal would save the $8 billion+ of the BART-San Jose extension, end the difficult and costly engineering of Pacheco, and replace the existing ACE service. It is easy to see why the contractors want to build as much as possible at public expense, but the foamers need to get a clue about how to make best use of very expensive capital infrastructure. In general I would appreciate if the conversation could stay on the topic at hand. I think the whole Altamont vs. Pacheco slugfest belongs on another blog, even if it is tangentially relevant to Atherton. This comment is self-contradictory. The problem with Altamont-with-a-split is that, in the name of one-seat rides to both SF and SJ, they'll reduce frequency. Even without one-seat rides, there won't be enough ridership to support X tph to both SF and SJ - SF will have to lose X/3 trains, and SJ 2X/3. The argument for Pacheco isn't that California needs one-seat rides without splits. It's that it needs no splits, period. Granted, the TGV does splits. That's why it can only run about 2 tph from Paris to each of two separate stations in Lyon, at its peak. The rest of the LGV Sud-Est's capacity is taken by trains that skip Lyon or branch to Lille or Dijon. Compare that to the Tokaido Shinkansen, the world's other at-capacity line, where there are 7 express trains from Tokyo to Nagoya to Osaka every hour. The splits in the LGV Sud-Est are a legacy issue coming from the fact that neither end of the LGV Sud-Est was built with through trains in mind. Tellingly, SNCF and SNCF-trained engineers do not do that anymore: SNCF endorsed Pacheco, and the TGV-based KTX is currently building phase 2 with a detour in order to put Ulsan and Busan on the same line. Among today's planned high-speed lines, the only one that has many splits instead of trying to put cities on the same line is Britain's High Speed 2. The problem with Altamont-with-a-split is that, in the name of one-seat rides to both SF and SJ, they'll reduce frequency. Train networks provide greater frequency than single line. As we are all world-class experts here, I don't know why this should even require debate. For San Jose, a train network obviously provides higher frequency over single line, even if some of that additional frequency requires timed cross-platform transfer in Fremont, Pleasanton, or Tracy between, say, a SJ-Sac and SF-LA train, or between SJ-Sac and Sac-LA trains. Similarly, Menlo Park, Palo Alto, and Atherton benefit from increased frequency and increased destinations possible with network model. There is, for example, tons of traffic coming into Menlo Park from the Fremont side of the Bay. Thus, the whole lawsuit business is not at all just some minor nimby issue over trees. Should Livermore (population 70k) be on the trunk line, or San Jose (population 1m)? Happily Altamont has both SF and SJ as co-equal destinations along with Livermore (Tri-Valley area station) as part of Phase I. Should Gilroy be part of Phase I in lieu of Merced, Modesto, Manteca/Latrop/Stockton (area), Tracy, Livermore/Pleasanton/Danville, Fremont/Union City and all at the cost of an overall shorter/faster route network at system-buildout including Sacramento? As mentioned by "Reality Check" Altamont also serves San Jose as mainline destination. So what is the purpose of comparing against Livermore? For Altamont, we get the following cities (in addition to San Jose). Unless someone gets the law changed, a Los Baños area station is illegal. So that makes the already-huge people-and-cities-served Altamont advantage even bigger. The point is why would you split trains if you don't have to? An altamont line, by serving SF an SJ as "Co-equal" destinations, means that train frequency will be halved for each. If you're going to tout the advantages for the altamont line you have to at least look at the disadvantages. Splitting trains or splitting service isn't the end of the world, but it's not an improvement. Putting SF and SJ on the main line where the same train can hit both is a huge advantage. If you want to get people from Sacramento to SJ, upgrade the capitols. That will get you a better route than altamont and it will enable Sac-SF, arguably a more important destination than Diridon. The Altamont split greatly helps ameliorate the SF Transbay Terminal capacity crunch HSRA has been yammering about, keeps HSR out of Palo-Menlo-Atherton-NIMBYville core and cuts the number of HSR seats/trains that need to compete with Caltrain for Peninsula track slots. This means 4-tracks may not even be needed the whole way between SF and SJ. As for Capitols vs. Altamont HSR for SF-Sacramento trips, all that counts is travel time. Imagine much extra it will cost in a Pacheco HSR scenario to make SF-Sac'to via the Capitols as fast as "full fat" Altamont HSR would be for a one-seat ride? Reality Check said that an Altamont alignment "keeps HSR out of Palo-Menlo-Atherton-NIMBYville core." If you're talking about using the Dumbarton Rail Corridor, note that a chunk of that runs through Menlo Park, and in fact more Menlo Park homes abut that route than abut the Caltrain ROW. Whichever alignment you choose, you're going impact Menlo Park. Suggesting that an Altamont route will be free of NIMBY opposition is magical thinking. And That's not to mention Fremont, Pleasanton, and Livermore NIMBYs. On a slightly related note, even if Altamont were chosen, it would probably still make sense to electrify, grade separate, and possibly even multi-track (to allow a more flexible express service), even south of Dumbarton. Strategic passing works fine when you only need so much capacity, but ultimately, the Baby Bullet system has its limits. Given population increases, and the fact that a modernized, fast, electrified commuter system will attract a lot more riders than CalTrains's current outdated slow diesel trains, I think we can expect large increases in ridership in the near future. That would work if California were building a Swiss regional line. But it's not; it's building Japanese-style high-speed rail. In the entire Shinkansen network, there are no timed or cross-platform transfers - the only break in one-seat rides is at Tokyo Station, which is intended as a terminal only. The TGV and KTX networks have no transfers, either. Korail, SNCF, and JR-East prefer to upgrade legacy lines to allow HSR through-running than to make people transfer. ...but with one third as many trains. And no, it won't be equal to SF - the EIR projects SJ will have one half the HSR traffic of SF. If for some reason CHSRA backtracks and picks Altamont you won't find anyone there who thinks SJ will get as many trains as SF, except maybe Diridon. @ Bianca -- yes, as a Menlo Park native, I'm well acquainted with city boundaries and the vociferous Suburban Park NIMBYs along the Dumbarton line between Marsh and 101. That's why I used the word "core". @ Alon Levy -- we should hope and expect SJ and SF would get service in rough proportion to -- and in accordance with -- demand. Gasp! Reality Check, both common sense and the ridership models used suggest SF would be the bigger destination. It's a bigger job center; it has decent connecting transit; it's a bigger tourist destination. Why do I suspect that Bianca is the embodiment of the term NIMBY? A resident of east Menlo Park near the Dumbarton route that wants to make sure all rail improvements are kept to someone else's backyard on the Caltrain corridor?? Anonymous at 8:16am, nice try. I live in Menlo Park, but I don't live anywhere near where the Altamont alignment would run. In fact I live about 2000 feet from the Caltrain ROW. I made that point because I have frequently seen arguments against the Pacheco alignment say that HSR on the Pacheco route "would destroy" Menlo Park. In the next breath the suggestion is made to build HSR on the Altamont alignment instead. The cognitive dissonance of proposing an alignment that also runs through Menlo Park and pretending that the same issues don't exist is breathtaking. Look, I never had a dog in the Altamont vs. Pacheco route. I see that both alignments have pros and cons. Now that the alignment has been chosen I think we should accept it and move forward; there are a lot of other questions to be resolved. And let me spell one more thing out, to be perfectly clear: it is entirely reasonable for residents near the route to have concerns. It's entirely valid for residents to work with the process to make sure that concerns about noise and aesthetics are taken into account. But when I hear people who don't want HSR to run through Palo Alto or Atherton or their part of Menlo Park claim that Pacheco would destroy towns and Altamont would not, I have to pipe up and tell people to look at a map. I don't expect folks who read this blog but don't live around here to be aware of how the squiggly lines on a map mean that regardless of the alignment, High Speed Rail will run through Menlo Park. Pacheco or Altamont, both will have impacts, most of which can be mitigated. Neither will destroy towns. Now, let's just get on with it and keep moving forward. The Caltrain long-range Plan calls for Dumbarton rail, regardless of whether HSR ever gets built. In fact, Dumbarton rail would be under construction right now, if the Measure 2 funds hadn't been stolen for BART Warm Springs cost overruns. Thus, for Menlo Park (and everyone else) Dumbarton alignment reduces the amount of duplicate infrastructure required, and the construction impacts. Drunk Engineer, like I said before, I'm not interested in re-opening the Altamont vs. Pacheco argument. I didn't stake out a position back when it was an open question, and I'm certainly not interested in debating it now.
" ... like I said before, I'm not interested in re-opening the Altamont vs. Pacheco argument ..."
"Bianca" says, making the usual tiresome and fallacious arguments and statements about the usual alternate universes and straw men. It's more accurate to just honestly say "like I said before, I want the last word. La la la I'm not listending la la ha" than to pretend not to be doing exactly what you manifestly are doing. The TGV and KTX networks have no transfers, either. Korail, SNCF, and JR-East prefer to upgrade legacy lines to allow HSR through-running than to make people transfer. While transit agencies do prefer to offer customers one-seat rides where feasible, this is not done "at any cost". Certainly not if doing so requires billions in extra infrastructure. SNCF (like any properly-run passenger service) has considerable schedule coordination and timed transfers. As academic exercise, we could spend all day pulling up examples from the online schedule. But what would be the point? What possible relevance does Paris-Grenoble have on SJ-LA? Transportation planners make decisions based on the "facts on the ground", not what some planners did thousands of miles away for totally different geography. SNCF (like any properly-run passenger service) has considerable schedule coordination and timed transfers. SNCF's regional services do; the TGV doesn't. The reason I bring up the TGV, the KTX, and the Shinkansen is that they come from completely different countries. I didn't bring up THSR because it's a one-line operation or the ICE because I'm not sure it's transfer-free, but the point is that timed transfers aren't a normal feature of HSR. And no, going to Altamont wouldn't save billions over Pacheco - the cost estimates are about the same. If you're talking about the billions spent on BART to SJ, then it's different, but Santa Clara County would probably find a way to build BART to San Jose no matter what. There are transfers that make sense, because low ridership makes it impractical to run direct service, or maybe because it is physically impossible to construct. NIMBYs are not really a valid reason to stop HSR service at San José, especially given the number of riders that will want direct access to SF.